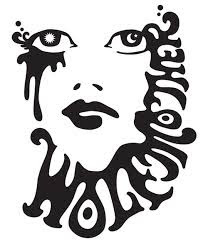 I can't thank my fellow concert & music-obsessed Facebook friend, Aaron, enough for hooking me up with 2 face value tickets for Wolfmother at Troubadour last night!! The last minute show was only announced on Thursday 7/11 &, of course, it sold out within minutes. I saw the announcement but, initially, did not even try to buy tickets because I already had tix for The Neighbourhood at The Fonda over 2 months ago. I was then informed by several credible sources that The Neighbourhood really isn't all that great live (at least not yet) so I took that advice, sold my Neighbourhood tix via Craigslist to an extremely enthusiastic fan &, VERY luckily, managed to snag a pair of tix to last night's Wolfmother show! Thank you, Aaron!!! A 2nd WM show was added (on 7/22) quickly after the 7/15 show sold out & those tix were also gone within minutes but, if anyone has any way of getting into that show next week, I highly recommend you do it 'cuz WOLFMOTHER HAS STILL GOT IT!!! What a BADASS show!